What is Patella Tendon Rupture? Patella tendon rupture is the rupture of the tendon that connects the patella (knee cap) to the top portion of the tibia (shinbone). The patellar tendon works together with the quadriceps muscle and the quadriceps tendon to allow your knee to straighten out. 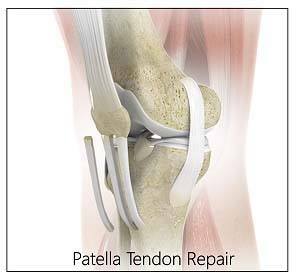 Patellar tendon tear can be a partial or a complete tear. In partial tear, some of the fibers in the tendon are torn, but the sof t tissue is not damaged. In complete tear, the sof t tissues are disrupted into two pieces.